On June 3rd in Fort Collins, CO, Leslie Glustrom of Clean Energy Action was awarded Colorado Renewable Energy Society’s (CRES) most prestigious award, The Larson-Notari, for her exemplary contributions in the field of renewable energy. Glustrom joins the ranks of leaders such as Governor Ritter and Amory Lovins in the receipt of this award. “I am thrilled to receive the Larson-Notari award, and I know the honor is a reflection of the team effort that has made our work for renewable energy in Colorado so successful. I accept this award on behalf of many passionate allies and friends,” said Glustrom. Becky English, chair of the energy committee for the Rocky Mountain Chapter of Sierra Club, and chair of the legislative committee of the Colorado Renewable Energy Society, along with 23 other CRES members co-signed the nomination. Glustrom’s tireless work on clean energy began in 2004 when she left her paying job in a CU biochemistry research lab and devoted herself full-time-plus – and without pay – to fighting climate change. Specifically, she targeted coal-fired power plants, because they are the largest single source of CO2 and account for some 40% of U.S. greenhouse gas emissions. In Colorado, the state generates significantly more than half of its electricity from coal with less than 10% of the state’s electricity coming from clean renewable energy. Glustrom recognized that decarbonizing the state’s power supply is critical to fighting climate change and repowering for the 21st century. Key to her approach – then and now – is a dedication to uncovering and disseminating the facts on all the costs of our fossil fuel dependence and the abundant potential and cost-effectiveness of deploying clean energy solutions. 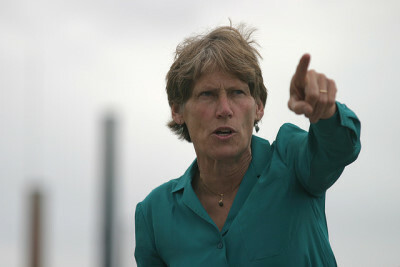 Within months of leaving her paid employment in 2004, Glustrom joined the ranks of citizens working to achieve passage of “Amendment 37,” the country’s first citizen-initiated renewable energy standard in the country. Shortly after this landmark victory in Colorado, it became apparent that the state’s largest utility was planning to build a coal-fired power plant (Comanche 3 in Pueblo, CO) and Glustrom, with a small, but committed, team of activists took the charge against the plant’s construction. Leslie applied for formal intervenor status at the CO Public Utilities Commission, representing herself. She is one of only a few citizens to intervene in formal PUC proceedings. Over the years, she has provided testimony in numerous proceedings involving resource planning, rate increases, solar energy incentives, transmission planning, “Windsource” and the “Smart Grid City” project, as well as many others. In addition to the extensive work at the PUC, Glustrom was one of the founding members of the Boulder-based non-profit group Clean Energy Action which has combined forces with many other groups to challenge the current fossil-fuel paradigm. These days, Leslie and Clean Energy Action continue to fight for a clean energy future at the local, state and national level. As part of this work, Leslie began an intensive analysis of US coal supplies beginning in 2005 and in 2009 published the report, “Coal: Cheap and Abundant…Or Is It? Why Americans Should Stop Assuming that the U.S. Has a 200-Year Supply of Coal.” She has spoken around the country on the issues of coal costs and coal supply constraints and in 2010 she was a co-author on the “True Cost of Coal” study led by Dr. Paul Epstein of Harvard Medical School. Leslie forges strong relationships and knows the value of coordinated and collaborative strategies to make positive change happen. The Larson-Notari award is a testament to the amazing efforts of Leslie and her many allies working for a clean energy future for Boulder and beyond. Good for Glustrom. I think she’s in it for the right reasons, authentic care for the environment.